Hello and a happy new year to everyone! I want to start this year with two models which appeared in the last two issues of BrickJournal, but haven't been presented to this fine community yet. First, there's the Twilight, a Corellian Engineering G9 Rigger transport. You will know this ship from the Clone Wars movie. When the model was built, there was not much reference material available yet, as it was before the movie was launched, but I tried to include all functional details, like rotating guns, all engines and retracting gun emplacements. The special "feature" of this model is that it consists of two sub models which slide into each other to give the complete model. It's one of the trickiest models I have ever built, and uses one SNOT brick after another. PS: Yes, I love the cockpit slope. There is an alternative with 1x1 slopes, but I still like it that way. 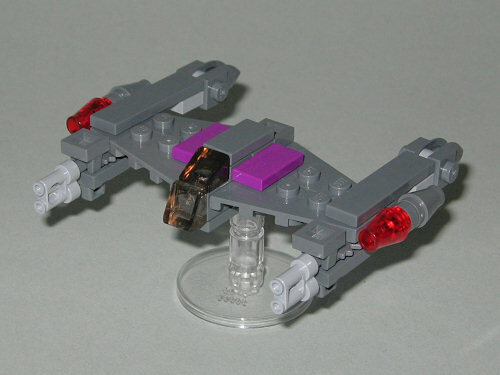 Second ship for today is the Porax-38 Starfighter, also known as "Magna Guard Starfighter". Its first appearance is in "Revenge of the Sith" but regarding the timeline it appears before in the "Clone Wars" movie. 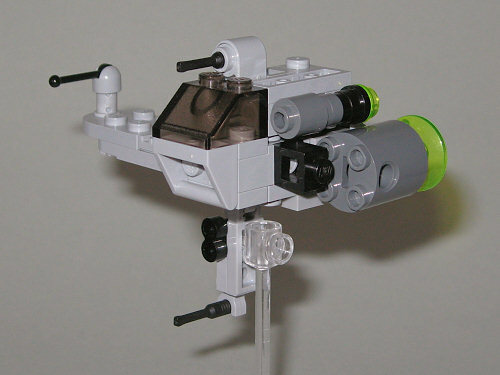 To build the rounded cockpit shape, two 1x1 slopes were used, attached to a headlight brick. The more tricky part, however, were the wings. I searched for a way to include those twin gun emplacements. But to attach binoculars you need a bar which has to be attached to the wings in a very flat way. Solution was the chainsaw, a very useful piece. Thanks for stepping by and have a great start into the new year! The Twilight is good, but the Magna Guard Starfighter is excellent! Clever use of the saw blades, and I love that touch of purple. Great job! I enjoyed both. The P-38 is sexier, cause the Twilight's cockpit doesn't look like the slit that it is. I just can't get over how ugly the Twilight is. You did a nice job, but my opinion will forever be clouded by how much I dislike that ship. I like the Magna Guard fighter a lot, the detail is great. Good job Chris. I just can't get over how ugly the Twilight is. I totally agree. It's a great mini, but I hate the ship. Still, both are perfect. You sir, truly are a MINI Master, both of these are just perfect. Great job. I've worked on a p-38 the other day, and I can relate to the trickiness of the ship. Nice use of the chainsaw and binoculars. As for the twi-light, I think you did all you could with that ship. You and banthabricks are the best Mini makers out there! The construction of the Twilight would perpex M.C Escher. Well done. You did absolute wonders for the Twilight. I love that practically every version I've seen in such a scale is such a vast improvement over the 'real' thing. The P-38, it's just beautiful. Seriously, the highlight of purple looks great. And the use of parts just has win all over the place; the chainsaw, the cheese, the binoculars. And the build of the wings is just very nice indeed. Another great two-some Chris. The Twilight seems to be universally hated but produces a great mini here It has some really tricky angles well pulled off. I would never have thought of that splash of purple on the P-38 but it really finishes it perfectly. That's a great mini of the Twilight (love the engine! ), but the P-38 is perfect! I love the binocs, and the 1x2 purple plates make the ship! and thank you very much for your interest and the nice comments! I agree with you all that the Twilight is not the prettiest ship in the Star Wars Universe, you're absolutely right with that. But nonetheless it was fun puzzling around with the odd shape.